The month-long exercise demonstrates the increased military cooperation between the two countries. Joint military exercise AHMOSE kicked off today with an inaugural ceremony at Mohamed Naguib base in Alexandria. The military exercise will bring together British and Egyptian troops and contribute to the growing strategic military partnership between both countries. 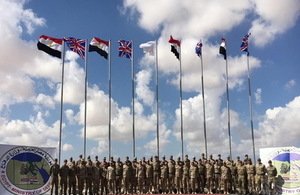 The month-long exercise will enhance defence cooperation between British and Egyptian troops as well as facilitate the sharing of expertise in warfare scenarios. Around 165 British military personnel will participate in the exercise. Egypt and the UK face the shared enemy of terrorism, which is threatening the stability of the region and the world. We know that in order to defeat this threat we must work together and share best practice in realistic scenarios. AHMOSE marks the beginning of increased defence cooperation between our countries, to develop and ensure a safer, more secure region. AHMOSE is a brilliant opportunity for UK and Egypt to work together on building our defence resilience. We are learning from each other and building on the strategic security relationship with Egypt, a strong partner and ally in the region. This exercise is another success story in our joint military work. Last year, the British and Egyptian Ministries of Defence signed the first Memorandum of Understanding to conduct joint military exercises as part of efforts to strengthen their counter terrorism cooperation. The UK has also joined forces with Egypt, the United States and a number of other countries in the Exercise Bright Star.